At 7:26 a.m. on the first day of January at Henoko, Nago City, citizens performed Ryukyuan dance with the background of the first sunrise from the ocean where the construction of the new base has begun. The construction of a new U.S. military base in the Henoko district of Nago to replace U.S. Marine Corps Air Station Futenma saw approximately 300 people gather to celebrate the first sunrise of the New Year. Nago Mayor Susumu Inamine was among those admiring the first sunrise at Henoko’s Matsuda nu Hama. “I want us to keep moving forward this year without giving up,” he said. 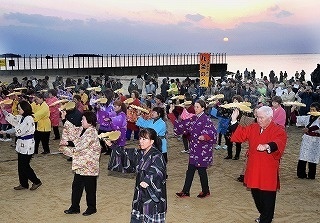 Volunteers, who oppose the construction of the new base, held a traditional New Year “Hachiukushi” event. Led by Yoshiyasu Iha, 35 musicians and 40 dancers performed a Kagiyadefu dance for the event. At the end, everyone joined for kachashi (Okinawan folk dancing) and line dancing and renewed their commitment to stop the construction of the new base.